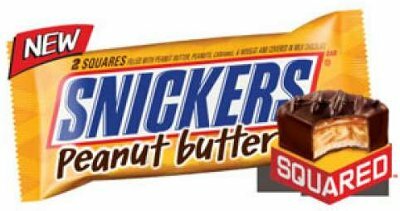 Snickers Peanut Butter Squared looks similar to a regular Snickers bar, but what’s nifty about this particular product is that Mars broke up it up into two separate squares (which unfortunately makes the overall weight of this candy less than that of a regular bar); the packaging even has instructions to â€œSave one for laterâ€ by twisting the wrapper closed. So if you’re looking to exercise a little self-control while eating a Snickers, these suckers will be a little easier to stash away for later. If you can wait that long. The squares are a little small, so it might be hard to stop after only one. OH! these looks yummy… i wonder if they taste as good as they look… hope retailers will have them soon. I wish England had so many different peanut butter treats… I’m so jealous of you guys!